Last Christmas, my husband gave us an Ancestry.com DNA test. I knew there was a lot of Norwegian in him. Little did I know that I had some of the Norse in my DNA, too. 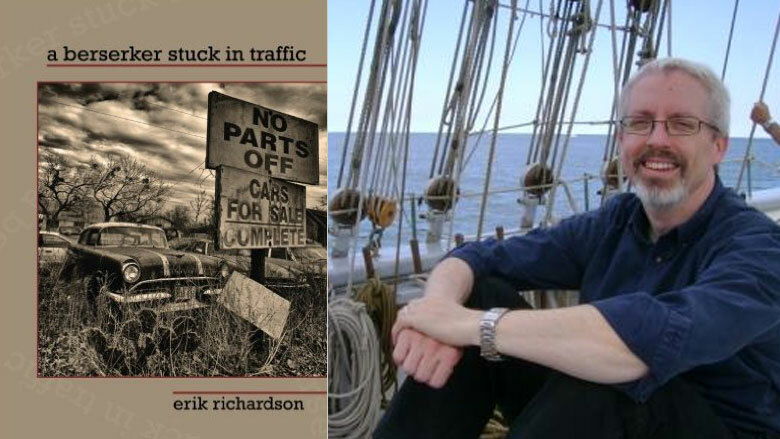 This might explain why I especially enjoyed Erik Rich­ardson’s new collection of poems, a berserker stuck in traffic. […] at a desk, staring at a screen. what time the sun died today or will rise again. Richardson is a skilled storyteller, incorporating mythologies of the Irish, the Norse, and the Greeks. He also manages to weave his tales, using math and science, the voices of Hemingway and Merton, the soft whispers of Heaney, and the mystery of the Bhagavad Gita. are promotions, delights, or life itself? he does not quit and is not bound. As such, all is not lost in Richardson’s poems. And he hasn’t gone entirely mad. There is humor amidst the banality, and there are constellations of wondrous light. the light goes green. the line moves on. of the hanged god, fading. pretend: you are just an accountant. of your car is a really. bad. idea. Savoring Richardson’s poems in this lovely book is a good idea. A really. Good. Idea.